Grace Church welcomes Gary Desmond on 26 April at 12:20 p.m.
Gary Desmond first studied the organ with Clifford Harker at Bristol Cathedral and then spent four years at the Royal Academy of Music with Douglas Hawkridge (organ) and Roy Jesson (piano). After leaving the Academy, he became a pupil of Susi Jeans and has since studied with David Sanger and David Briggs. For many years, Gary was Organist and Director of Music at the City Parish Church of St Stephen, Bristol, where he arranged a busy annual music programme, and also Director of Music at Bristol Grammar Junior School. Whilst at St Stephen’s, he directed the choir in broadcasts on BBC Television and Radio and was also conductor of the St Stephen’s Singers. 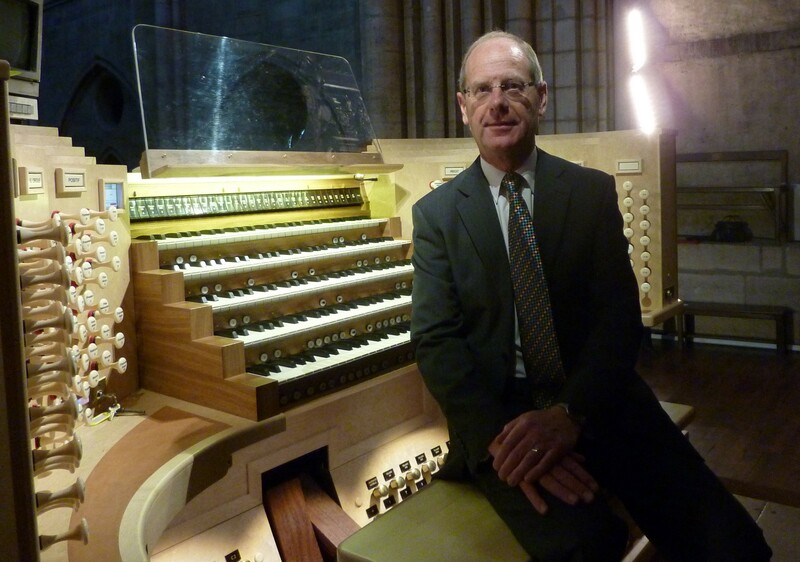 On three occasions Gary was elected President of the Bristol and District Organists’ Association and has served several terms as a member of the Advisory Committee of the Incorporated Association of Organists. He is frequently invited to be the accompanist and organist for local choirs and choral societies and he has also acted as organist for BBC Radio Bristol. Gary Desmond has given many recitals in the Bristol area, including the Colston Hall; other venues have included St Paul’s Cathedral, Westminster Abbey, Westminster Cathedral and many other cathedrals and churches in the UK. He has also given recitals in Germany and, since 2002, he has played regularly in the recital series at Notre-Dame Cathedral, Paris. Visits to the USA have included concerts in First Congregational Church in Los Angeles, Grace Cathedral, San Francisco and Washington National Cathedral. He is now a freelance recitalist, accompanist and teacher and, since 2008, he has been Deputy Organist at Bath Abbey. Recent recital venues have included St Stephen, Walbrook (City of London), St Edmundsbury and Liverpool Metropolitan Cathedrals, Bath Abbey and a return visit to Westminster Abbey. Venues in Germany have included the Marktkirche, Wiesbaden, Münster Cathedral and Altenberg Cathedral; to the USA – Grace Cathedral, San Francisco, Cathedral of Our Lady of the Angels, Los Angeles, and the Presbyterian Church, Pasadena, and a further recital in Notre-Dame Cathedral, Paris. The programme for 2016 includes concerts in Bath and Tewkesbury Abbeys, London (Walbrook), Scotland (Ayr Town Hall, Glasgow Cathedral, Kelvingrove Gallery and Museum), Armagh Anglican Cathedral and in the US – Boston, New York City and Los Angeles.